The arrival of the iCandy Raspberry at BBHQ has been eagerly awaited. We did place an order for a Raspberry when they were first released. However, there were some initial teething issues, so we waited to review the Raspberry until the improved batch arrived in the UK. 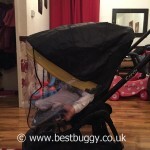 One of the Best Buggy Focus Group also has a Raspberry, and she has helped with this review. There is a choice of two chassis finishes – matt black or brushed aluminum. The hood is sold as a separate Flavour Pack and comes in seven colours: Arctic Night (black), Atlantic (pale blue), Lush (red), Beetle (grey), Wisteria (purple), Fuchsia (pink) and Sunflower (yellow). As the iCandy Raspberry emerged from the wedge shaped box, it is very noticeably lightweight, with a slender chassis. Opening the chassis is not immediately obvious. It took us a few minutes, and the instructions, to work out how to open the frame, even though we had tried the Raspberry out several times previously! Once we worked the knack out, it was so easy to do that we wondered why it had taken us so long! The chassis glides open beautifully, and then clicks to lock. We tried to add on the Flavour pack hood without reading the instructions, which didn’t work! So once again, we did have to reach for the instructions, but once we got the knack, the hood zipped on easily. With the hood on, we were ready to go! The iCandy Raspberry all round is deceptive. It is a tiny neat, narrow, pushchair. However the seat measurements are surprising. The seat back is 57cms tall, which is the equal largest seat we have measured here at Best Buggy HQ. The seat depth is a generous 34cms which means that the seat all round is larger than both of the other 57cms seats – those on the Baby Jogger City Versa and the TFK Joggster Twist. This will explain why Little Miss BB aged 6 (116cms tall) looks really comfortable in the Raspberry seat. There are very few pushchairs which we would even contemplate trying her in these days. But she does fit the Raspberry. The seat height means that the top of the seat (although hidden behind the hood fabric) comes up a long way behind Master BB’s head (100cms tall). Importantly, this means that there is plenty of length in the seat when Master BB needs a nap, without his head protruding off the edge of the seat. At 80cms long (flat), or 86cms long (with the curved front edge), we also suspect that the Raspberry seat is one of the longest lie flat seats there is. The seat is reversible, so that it can both face the parent, or forward face. There is no footrest when the seat is parent facing, however little legs are well supported on the unusually shaped curved edge seat base. There is a small foot ledge when the seat is forward facing. It was enough for small heels to rest on. Bear in mind, that Master BB is at the upper age range for use for a pushchair. The last time we tried him in the Raspberry, he could not reach the footrest. The seat itself is well padded. We LOVE seeing Master BB with his legs crossed in a pushchair, because it is usually a sign of a seat with good depth and that he is super comfortable. The baby in the photos is 11 months old. He loves his Raspberry and he fell asleep whilst taking the photos. The seat is relatively low for a pushchair – this may be a disadvantage for some. However, for an older toddler it is a big positive, because the child can clamber aboard themselves, which saves your back, and it gives the child independence. The seat can lie completely flat (suitable from birth). It also has a mid recline and a lovely upright seating position for an older toddler. The seat is made up of two panels – the back piece, and the seat piece. Between this, is a concertina style piece of fabric which stretches to fill the gap when the seat is reclined. Thus the child is fully supported. The seat recline is operated using a very simple button recline at the back of the top of the seat. It is very easy to do. However, we were disappointed to see that the Raspberry harness was extremely tight on Master BB. We phoned iCandy up, who immediately dispatched us a longer crotch strap. This has been fitted and does make a small difference. However, we still need some extra length on our harness. Whilst we appreciate that Master BB is one of the taller children to use the Raspberry, he isn’t chunky. We have managed to get the harness done up with a thick winter coat on, but it is a struggle, and it should not be like this. We had to fit the new crotch strap, and we also had to alter the harness strap height for Master BB. This was unusual to do because the rear of the seat is covered in a thin material. Through this, you can feel the harness clips and push them in and out fairly easily. We like that the seat fabric can be easily un-velcroed for cleaning. There are three harness height settings. The harness itself is made of strong webbing with a sturdy buckle which is difficult for a toddler to undo. We like the style of the iCandy harnesses and buckles. One of the downsides of having a lie flat seat, as opposed to a bucket seat, is that the harness needs adjusting when a child needs to be laid down, or sat upright after sleeping. This is usual on all lie flat seats, but it takes a little getting used to when you are used to the other iCandy bucket style seats. Overall the harness is good – it just needs to be longer. The iCandy Raspberry is suitable from birth. The seat is a lie flat one. The newborn is completely supported on the seat, and the harness can be done up tightly. iCandy make an optional newborn pod to keep a small baby securely swaddled whilst in their pushchair. The double wrap design will keep the baby warm in winter. The outer layer is knitted fabric, with a fleece inner layer. The pod can be undone, leaving the base as a liner for the seat. There are car seat adaptors available as an accessory. They clip in easily to the seat sockets and the car seat fits on top. The adaptors are compatible with the Maxi-Cosi Cabrio, Pebble and BeSafe iZi Go infant carriers. The Raspberry hood comes as a separate Flavour pack to suit you; your baby; the season; or to match your outfit!! The hood attaches using a clip on each side, and a zip around the back of the seat. As stated we had to reach for the instructions to help us to fit the hood. However, the instructions are clear, and we sorted it out easily. The hood is a Lycra type of material. It is apparently SPF50 rated, and water resistant. However we do not like this type of fabric on a hood. As Master BB shows in these photos, Lycra is a great material to poke, stretch, push against or wrap yourself up in! Master BB did insist on playing with the hood lots! He found it easy to push up and down and played this game to his hearts content. It is worth noting that this Lycra type of fabric can be easy to ‘pull’ on anything sharp, and does bobble across time. If we could change one thing on the Raspberry, it would be the hood. The one positive is that the Raspberry hood frame is sturdy, so that the hood doesn’t sway like a competitors pushchair hood does! The hood is a very generous size when it is pulled fully taut and open. The hood is easy to push silently open and closed. It is so easy to do that Master BB liked entertaining himself playing with the hood (see the first four photos!). The flip side of this is that when I wanted the hood open or closed, Master BB would do the opposite! The basket on the iCandy Raspberry is one of the best features. There are two parts to the basket. First of all there is the storage pod. This is a hard plastic case with a hinged lid. It is a great space to store a raincover or small soft items (hard items will rattle inside). iCandy actually send the Raspberry packaged with the raincover inside the pod. The early Raspberry strollers rattled when pushed. However, our Raspberry has a dampener to prevent this happening. We haven’t noticed any noise from our storage pod at all – it is silent. The storage pod can be accessed when the Raspberry is folded, which makes it a handy place to store a purse or phone out of sight at playgroup. The second part is the main basket itself. First of all the basket is huge – much larger than it looks! It is deep, and enclosed high up the sides. There is access to the basket whether the seat is forward or reverse facing. The Raspberry basket was fabulous on a shopping trip. No matter what we put into it, there always seemed to be room for more! Access is more open from the rear – the storage pod at the front does limit the size of items through the gap. However, my medium sized handbag fitted through either way. It was useful to be able to lift the seat pad up to access the basket from the front, once the child had been removed from the seat. This makes it easy to get items in or out – this has been a huge bonus as we both have bad backs, and it saves us having to dig in the basket for the things right at the front. The seat pad will stay open until you close it again. The raincover fits really well onto the Raspberry. It is a bit of a shame that the coloured hood is obscured by the black fabric, but a raincover is functional. We love the flexible plastic with the good ventilation holes to prevent the raincover from steaming up. We like having somewhere to store the raincover when it is not in use, thus not filling up valuable space in the basket, nor having a wet raincover dripping over the basket contents. We will confess to being initially a little disappointed when we saw the small solid wheels. We believe they are solid rubber on plastic. However when we got the Raspberry out and about……it was WOW!!! The iCandy Raspberry handles superbly. The best we can describe it, is like pushing a stroller on ice. The iCandy Raspberry simply glides across flat surfaces. Even with the Raspberry at its maximum capacity (15kgs), it was a simple, one fingered push. The Raspberry literally steered itself! It is a long time since we have had a pushchair which was so super easy to push. The steering was so easy – one tiny nudge of the wrist and the Raspberry would change direction easily. We have enjoyed weaving in and out of displays in shops. However, the Raspberry is not an off road pushchair! You know about it when you meet a rough surface or bumpy surface – the Raspberry rattles and vibrates on lumps and bumps. ‘Urban’ is the word which describe the use of the Raspberry well – think shopping malls and smooth surfaces. The Raspberry also has all round suspension. We believe that the suspension is being improved, but we have had no issues with it. The front wheels do not lock. Most people probably never lock their pushchair wheels, but we do for photos, so it was noted! There is really no need for lockable wheels on an urban pushchair. However, the wheels do not cope well with dropping off a small step or kerb. This needs doing carefully. The handlebar itself is slim and covered in compacted foam. This makes it beautiful to hold in your hand – most of the time you simply do not notice you had a pushchair because your hand was merely resting on the handle as the Raspberry glided along. There are 4 handle height positions. These range from very low down – so that Little Miss BB could push – right up to a height which unusually was too high for me! (I am 5ft 6ins tall). In fact, one of my issues when doing this review has been that Little Miss BB has claimed the Raspberry as hers, to push her brother along in! It is perfect for her to push and she loves doing so! Lightweight can still be robust – and the Raspberry certainly is sturdy to use. This is a huge selling point for the Raspberry over its competitors. iCandy have managed to achieve the sturdy lightweight stroller with little compromise. Nothing flexes, nothing leans. However we found the Raspberry creaky at times when out and about – and even when with no child in the seat – and this really needs investigating. The Raspberry is 0.1kgs lighter than the Bugaboo Bee3. The Raspberry is just 1cms wider. With the feeling of neatness, this made shopping an absolute pleasure. Even in the most crowded shops, at no point did we feel ‘in the way’. When extra space was required in busy lifts, we simply lowered the handle to make more room. The only compromise of the Raspberry being so light to push, was that we had to remember to put the brake on at all times, especially on a slope or when it was windy! The Raspberry is one pushchair where we would actually have liked a wrist tether strap. The brake is situated in the centre of the back bar. It is easy to flick on and off, and is decisive. It was more difficult to locate when the seat was parent facing, but certainly not impossible. We suspect the addition of a footmuff would make locating the brake more difficult. The Raspberry seat removal is very simple. Underneath the two seat connections on either side of the chassis, are two flat pieces of plastic. If these are squeezed inwards, then the seat really simply, pops off the chassis. It can be done one handed, which is useful. It is just as easy to turn the seat around and drop it back into place. We tend to fold the seat up to give easier access to the seat release pieces, however, it could probably be done without folding the seat first. The Raspberry has a fold which reminds me very much of the iCandy Cherry. The fold is quick and easy. Before folding the base of the seat needs folding upwards to meet the seat back – like a clamshell, in line with the handle. One tip from us, is to ensure that the harness buckles are on top of the seat, so that they don’t get caught down the sides of the seat before folding. There is a secondary lock on the left hand side of the handlebar – a black block with a silver pin. By squeezing the button in the centre of the handlebar in, and then pushing the handlebar down, the secondary lock is then released. Then simply put your fingers inside the two moulded plastic pieces at the top where the chassis joint is in the middle. Slide these up, and the Raspberry folds into an amazing freestanding position! No scratches on the frame from folding is bliss! The Raspberry is extremely sturdy when freestanding too, although the front wheels look a little odd splayed! There is access to both the basket and the storage pod when the pushchair is folded. The Raspberry is a reasonable size when folded. It fits easily into our car boot. The ease of fold combined with the lightweight, make the Raspberry a perfect car buggy. We absolutely love the iCandy Raspberry. The Raspberry is one of our all time favourite pushchairs…ever. 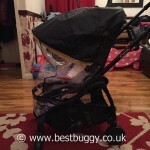 It ticks all our boxes for a perfect pushchair. The manoeuverability, push, huge accessible basket, large seat, easy fold and freestanding fold are all fantastic. The ease of push and steering are phenomenal – there is nothing else as easy to push on the market currently. With a larger child on board, this counts for a lot. We would love to give the Raspberry our top star rating. However, we pride ourselves on being honest and objective, and there are some negatives, which can’t be ignored. These are mainly the poor quality hood fabric; the creaking chassis, the short harness, and being careful about the front wheels when coming off a kerb (true with a number of pushchairs, not just the Raspberry). The harness and hood fabric could be easily resolved. However, the Raspberry has so many positives, because it is so beautiful and easy to use, that the negatives do fade into relative insignificance. 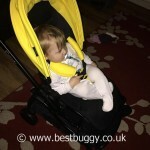 We are giving the iCandy Raspberry a 4 and a half Best Buggy gold star rating. We sincerely hope that iCandy take our comments constructively, and resolve the issues which we have, and produce a perfectly executed Raspberry soon, for us to give 5 gold stars to! Would we recommend a Raspberry? Absolutely! With many thanks to iCandy and Sarah for their help with this review.